Workers who spend excessive amounts of time at their desk could be putting their lives at risk, research suggests. The Medical Research Institute in New Zealand found they may have a higher risk of developing potentially fatal blood clots. The researchers found a third of patients admitted to hospital with deep vein thrombosis (DVT) were office workers who spent hours at a computer. The study will be published in the New Zealand Medical Journal. DVT is the formation of a blood clot in a deep vein, most commonly in the legs. The clots can travel to the heart, lungs or brain, causing chest pain, breathlessness or possible death from a heart attack or stroke. The condition has been dubbed "economy class syndrome" because passengers sitting on long-haul flights without space to stretch out were considered as most at risk. The New Zealand team examined a sample of 62 people admitted to hospital with blood clots, and found 34% had been sitting at their desk for long periods. In comparison, 21% had recently travelled on a long-distance flight. However, the researchers accepted that many more people sit at their desk for long periods, than travel on long-haul flights. Lead researcher Professor Richard Beasley said some office workers who developed clots sat at their screens for 14 hours a day. He said: "Some of them were going three to four hours at a time without getting up." 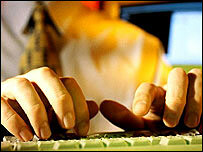 Professor Beasley said the problem was most common in the information technology industry and in call-centres. Professor Cary Cooper, an expert in organisational psychology and health at Lancaster University, said he was not surprised by the findings. He said people were working longer hours than ever before, and often not taking a proper lunch break, preferring instead to eat a sandwich at their desk while attending to emails. "People who work in offices are not actually getting up and walking around like they used to," he said. "New technology has made it easier for them to do this. I think it is causing people physical trouble because they are not taking exercise, but also psychological trouble because they are not interacting with their colleagues, or teambuilding in a face-to-face way." DVT affects about 100,000 people and kills up to 1,000 people in the UK each year. A recent study by the Chartered Management Institute and Workplace Health Connect found employers are failing to provide adequate levels of health and well-being support. It found fewer than one in five organisations conduct workplace health evaluations and fewer than half provide staff with ergonomic advice.